Well, after a week of sewing (loads of orders this week) and an unwell child, I finally completed my entry for the art raffle. The theme was flights of fancy and I decided to do a fabric page called evolution - pastel, in practice for a fabric CJ I'm about to get involved in. I made a page as a base using curtain fabric backed with calico. I then picked out the flowers in fabric paints, crazy quilted around them and then appliqued a bird in the same fabric, highlighted in chalks. I liked the colours of this and the layering of 2 of the same fabrics but was less happy with the paint. 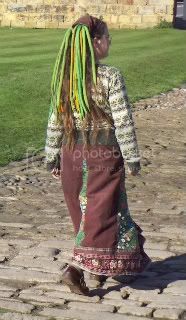 So the next one 'Evolve' had subtler glitter highlighters on lighter tones, and beadwork to the tail. This will be the first page in my CJ. Excuse the poor photo - it's dark in my workroom now. 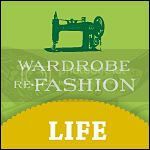 Pretty floral backing, soft soy jersey top and absorbant hemp inner, with a hidden waterproof layer and popper fastenings. Pretty, comfortable, eco and reliable, and not in the least bit scary. Today is the first day of my new artistic life. So, what devices have come up with, what wonders have I achieved? Well, it turns out several of my customers decided they'd like some custom sewing this weekend so I now have a pile of work instead of projects. 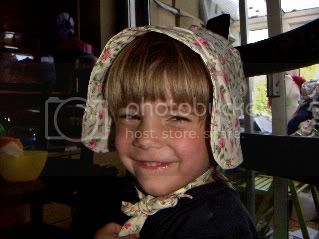 But that's not all bad - the first item to make was one of my favourites, a prairie bonnet. I like making bonnets. The initial assessment looks straightforward but the design has enough potential for quirky mistakes to keep me interested. And the results are always pretty and often funky, especially adult retro ones. 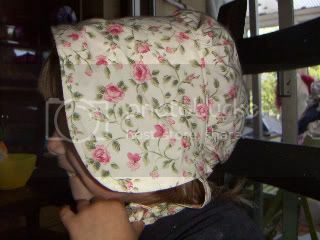 So here it is, a pretty bonnet for a little girl who adores Laura Ingalls Wilder. I hope she likes it. The cute girl modelling is actually a boy! I made some chokers too, perhaps I'll get round to finishing them.